Watch Ben Johnson and Alan Didak lead the VFL Magpies in a stirring rendition of Good Old Collingwood Forever after defeating Geelong by 13-points. Watch Ben Johnson and Alan Didak lead the VFL Magpies in singing Good Old Collingwood Forever after beating Geelong on Saturday at Victoria Park. 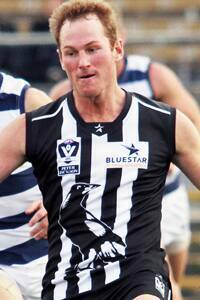 Ben Johnson collected 28 possessions in his return from calf soreness against Geelong in Saturday's VFL win. Photo: Shane Barrie. Collingwood’s super Saturday was made all the better by the performance of veteran rebounder Ben Johnson in his return from a calf injury in the VFL. Johnson did not appear to be hampered by any injury niggles as he collected 28 possessions playing mainly across half back. His trademark run and carry was evident and he was willing to push further afield towards the half forward line where his wise ball use and cleverly directed left foot kicks gave his key forwards high quality service. Recap collingwoodfc.com.au's live coverage of Saturday's VFL triumph. The 32-year-old told collingwoodfc.com.au that his body pulled up as well as he could have hoped after his first game since the senior side’s loss to Hawthorn in round three. "I haven't played since the Hawthorn game (due to a calf injury) so I'm a little but rusty but by the end of the game I got into it a little bit and it was just good to have the win,” Johnson said. "It's all right. I've got a little bit of work to do. I've got to work on my fitness a bit but that'll come as we play a few more games." Dale Tapping, who was coaching Johnson for the first time, couldn’t have been happier with the veteran’s approach to his return. “It’s just good to have him back and playing footy. He just looked like he was having a bit of fun out there for a 32-year-old,” smiled Tapping.